This league is currently in progress and is scheduled to end on March 01, 2017. 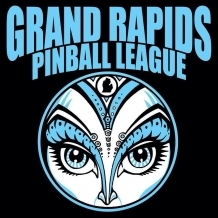 The Grand Rapids Pinball League meets at the Pyramid Scheme the 1st and 3rd Wednesday of the month at 7pm during the following months: January thru April and July thru October. Anyone who is 21 and older can join the league (Pyramid Scheme is a bar/music venue) and there is no cost to join the league other than coin drop on the machines. Each league night we play in groups of 4 (or 3 if there is not enough players) and we play 5 machines each night. Each player gets to choose at least one machine a night. After all the games are played, we count up the points and post them on our website at http://www.grpl.info. The most points a player can get in a single night is 35 (7 points for 1st, 5 points for 2nd, 3 points for 3rd, 1 point for 4th). At the end of the 8th league night of the season, we add up all the points to determine the winner for that season.